Compiled research from the Universite de Montreal shows that individuals eat better and exercise more today than they did during the 1970’s, yet obesity rates continues to rise. What has changed? Researchers contend that we aren’t moving as much as we used to at the office. Americans waste more than $40 billion annually on diet products and then are forced to sit in an office chair for 8 hours a day. Obesity rates are continuing to climb along with obesity related diseases. A compiled study released from the Universite de Montreal published in Preventative Medicine analyzing health trends contained in a Canadian health database of more than 132,000 respondents showed a 10% rise in obesity rates from the years of 1978 to 2004 despite a corresponding rise in exercise and healthier eating habits. Their findings have significant implications for employers worldwide. The researchers contend that the increase in weight was due mainly to office inactivity. TrekDesk Treadmill Desks hopes to reverse this trend, allowing employees the opportunity to move slowly through out the day; preventing obesity and disease as well as boosting mood and productivity. "People eat better and exercise more today than they did in the 1970's, yet obesity rates continue to rise," says lead author Carl-Étienne Juneau, from the Université de Montréal in Preventive Medicine. "My hypothesis is that our professional life is linked to this seemingly contradictory phenomenon." “Americans waste more than $40 billion annually on diet products and then are forced to sit in an office chair for 8 hours a day. Obesity rates are continuing to climb along with obesity related diseases. 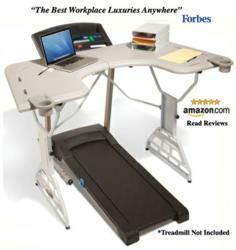 This research and many other studies show that we must get employees moving again to restore health and prevent obesity,” stated Steve Bordley, CEO of TrekDesk Treadmill Desks. Join the TrekDesk “Movement Revolution” to learn more on TrekDesk’s Facebook page.